So I think you all figured it out! We had an OZ-some time at our church’s Halloween party on Saturday night. 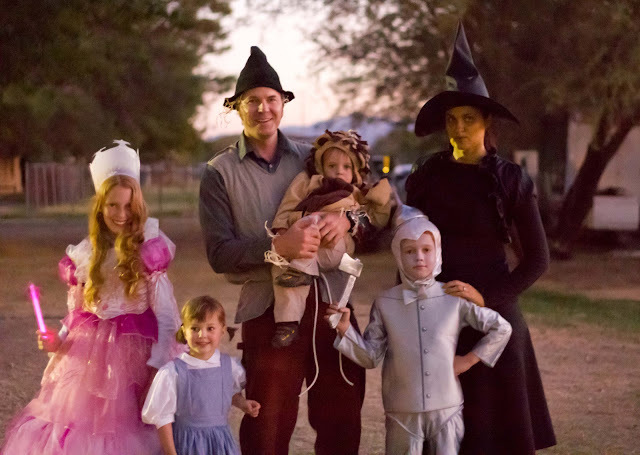 And we went as the Characters from The Wizard of Oz! 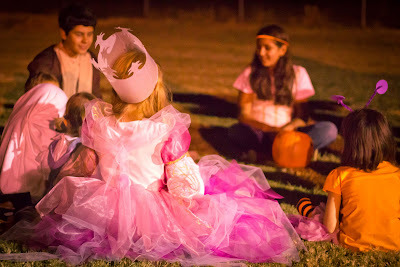 Of course, we were running a little behind schedule, so the light was about gone by the time we started taking pictures. 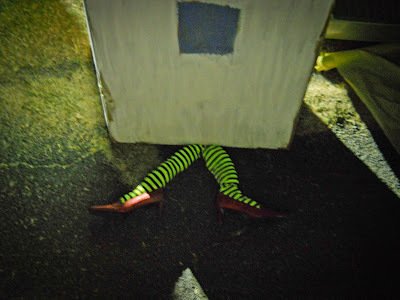 I may try for some better ones tonight when we go Trick or Treating, but I have a feeling that by tomorrow, you’ll have all moved on to Christmas, so I’m posting today! We are by no means the first family to do the Wizard of Oz, but it is such a great theme for family dressing because of the variety of characters, and the witch ties it in nicely to Halloween. 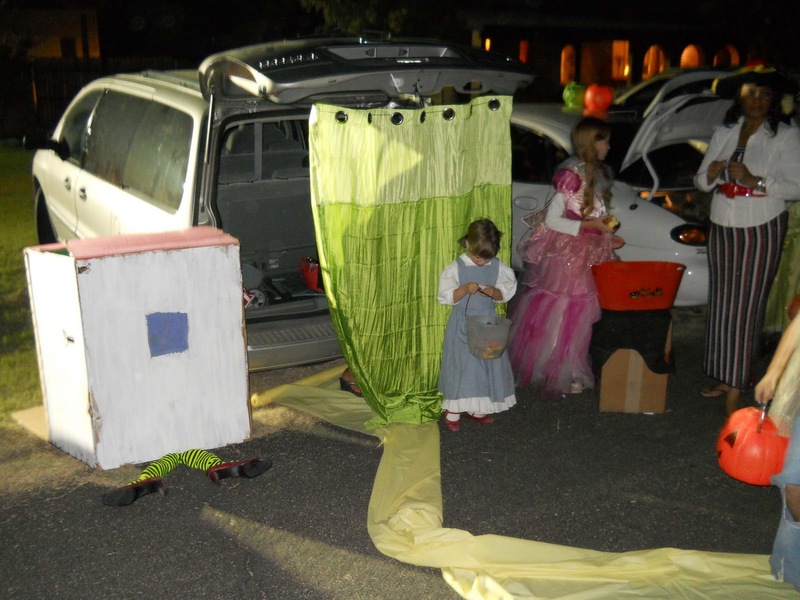 Our efforts earned us the best Family Costume Award at the party! 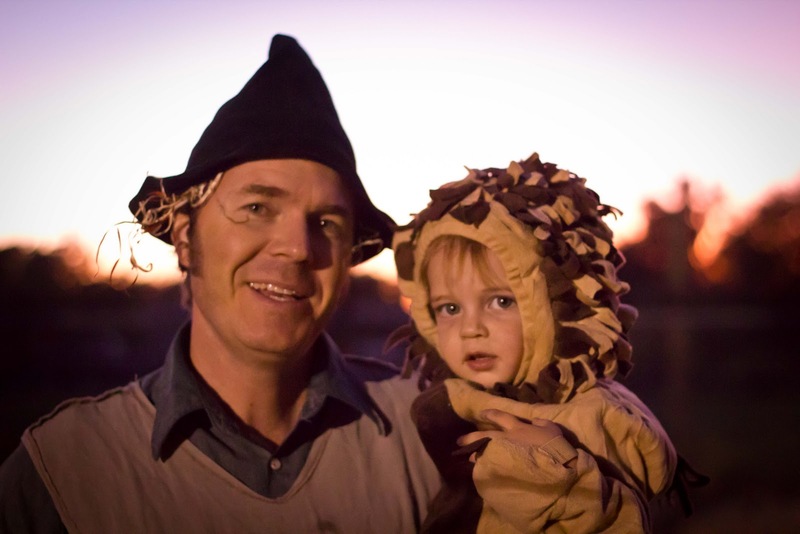 The scarecrow and lion were pretty easy to pull together. BSB wore a hat my mom had made when he was a woodsman from years back. We also had the tunic around that he was able to wear over his own clothes. I took raffia/straw and hot glued it to strips of felt that we tucked under his hat and cuffs. They were easy to remove and more comfortable on his skin. We scored on the lion costume! 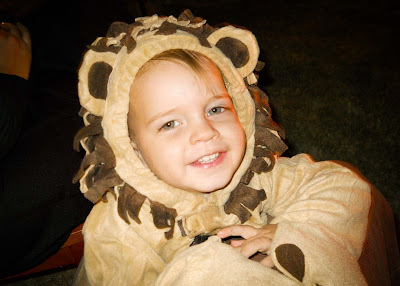 My friends were getting rid of a huge amount of costumes and happened to have this adorable lion! It was so cute and comfortable–He kept it on the whole night! 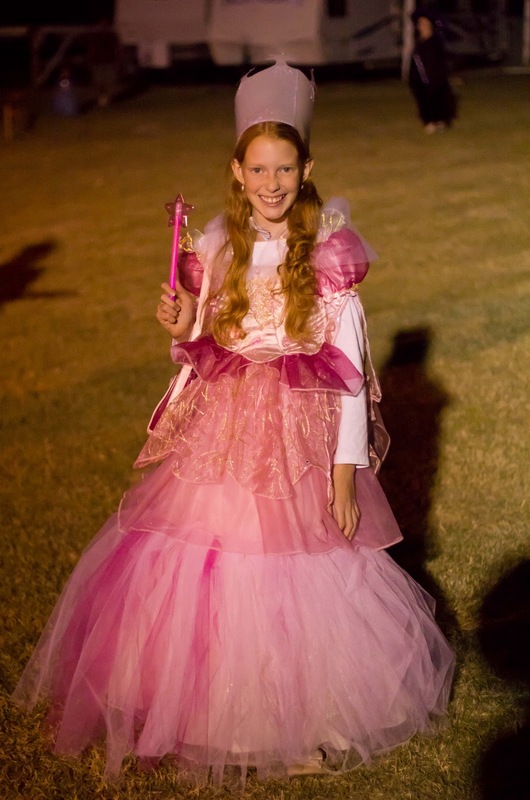 Glinda was definitely the most labot-intensive costume for me to put together. For the base I used a Barbie princess dress-up costume intended for children half her age. But it needed to be longer and poofier. She wore several skirts underneath and I hot-glued rolls of tulle to the underside of her skirt.. I made her crown out of make-your-own-stencil plastic and hot glue. It worked quite well and made it obvious who she was. She made her own butterfly necklace, but you can’t see it in these pictures. She looked like she was floating wherever she went! 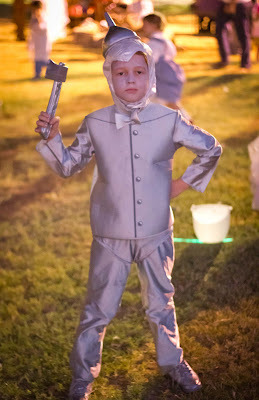 I was thinking about doing the Wizard of Oz for Halloween this year (already had the Dorothy costume) when I found the tin man costume on sale on-line for something like $5.00. 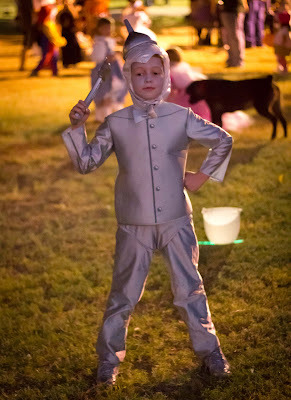 Of course, the head piece didn’t fit my son’s giant noggin, so we used the piece my mom had made for him when he was a knight in Narnia, and duct taped this funnel that we had spray-painted silver on top. I also spray painted his ax (from a Dollar Store kit) and old tennis-shoes. Dorothy is the one that started it all. 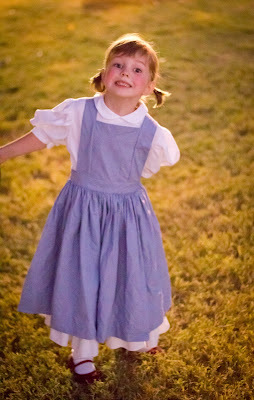 While we were visiting my parents this summer, my mom did a drama camp with her grandkids and made this costume for my daughter for her role in the play. 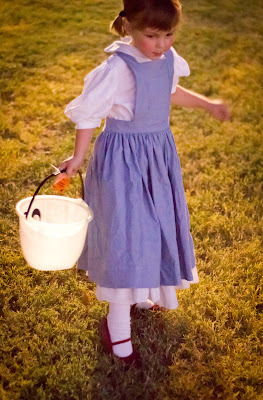 Of course, it was an amazing costume, because that is how my mom rolls, so we had to make further use of it. I spray painted a pair of her red shoes that we wearing out with glitter blast spray paint. 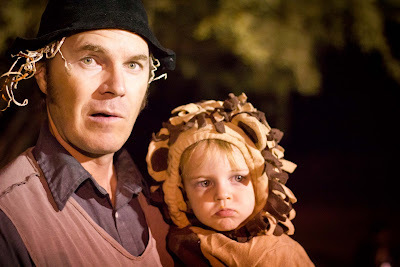 My costume mainly came from my closet. I already had a witches hat and broom. I had to do the green paint this time. Not sure if I will go through that mess again tonight, but it was necessary for me to be the “green girl”! 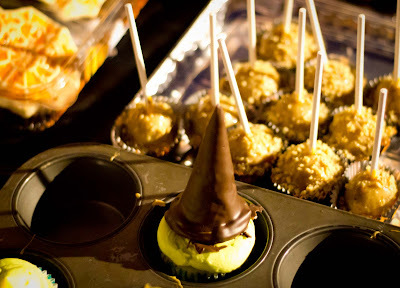 I made these witches hat cupcakes for the party and they disappeared in record time. By the time I got back to the table with my camera, there was one left so this is the only picture. 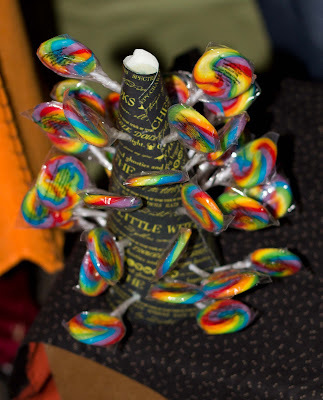 We used oreos for the base of the hats and sawed-off ice cream cones for the pointy party. I pinned a few similar cupcakes in my Green Halloween board. I also made these eyeball mini-cupcakes. If you are interested, remind me next year, and I will tell you how to make them and share a printable to go along with them! They went pretty fast, too. Except they looked much cuter than this picture shows. I only had a second to take this before it was disassembled by anxious children. I found the suckers on amazon . 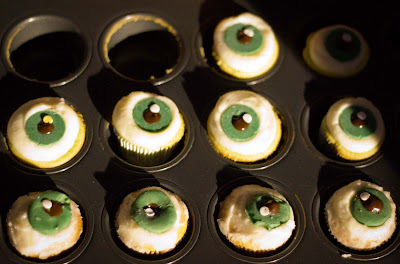 I am very interested in knowing how you made the eyeballs. I’ll be making mini cupcakes for a Halloween party and thought these looked great.